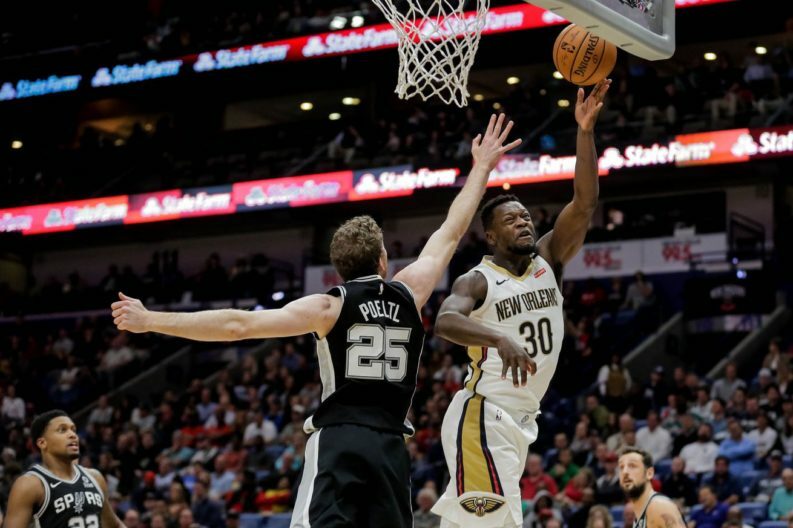 The Spurs’ road woes continued as the Pelicans pulled away with Julius Randle’s triple double. After Sunday’s win against the defending champs, the Spurs ran out of steam against the Pelicans in their second contest of five games in seven days. Early on it was Dante Cunningham’s homecoming as he was active on the boards and scored quick points off of putbacks and a barrage of threes. The Spurs built an early lead behind scoring from Cunningham, Rudy Gay, and Bryn Forbes. But once Cunningham left for the locker room with an apparent injury, the Spurs missed his energy and ceded their lead to the Pelicans by halftime. Cunningham came back at the start of the second half, but the Spurs looked like they left their fire in the locker room because the Pelicans jumped on them and extended their lead. Though the Spurs closed the gap to a single point with 6:36 left in the third, New Orleans went on a run San Antonio couldn’t match, and the game slipped away. Scoring was not a question mark, but the Spurs’ defense had no answers tonight. For the second straight game, Derrick White came off the bench and Bryn Forbes started, which might be their best formula right now. Speaking of Bryn Forbes, he is shooting the ball (especially from three) incredibly well. Anthony Davis was a monster this game, even though LaMarcus Aldridge usually does a good job of slowing him down. E’Twaun Moore has been in the league for 8 years with 4 different teams but has averaged less than 10 points per game in 6 out of those 8 seasons. He’s currently averaging a career high 15 PPG this season for the Pelicans. If I was commissioner for a day, I’d change New Orleans’s name back to the Jazz and change Utah’s name to the Utah JoSSS (John Stockton Short Shorts). San Antonio returns home to play the Memphis Grizzlies on Wednesday, November 21 at 7:30 PM CDT before heading out for a four-game road trip.